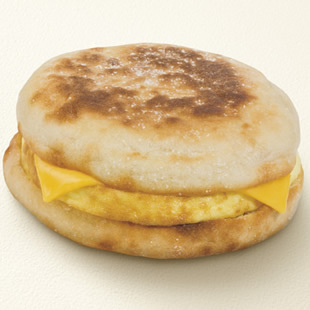 Find out how to make the healthiest choice on your next fast-food breakfast sandwich. Breakfast is important—it fuels your morning and may help keep your hunger in check so you don’t overdo it at lunch. Although making breakfast at home is ideal—you have more control over the ingredients and can make sure you have a healthy, balanced meal—there are times when you need or want to pick up breakfast on the go. Many popular fast-food restaurants now offer breakfast sandwiches, which spurred me to look into the healthiest (and least healthy) options. Here’s what I found out about some of the healthiest breakfast-sandwich choices and the worst, which you should skip. Download a FREE Quick Breakfast Cookbook! 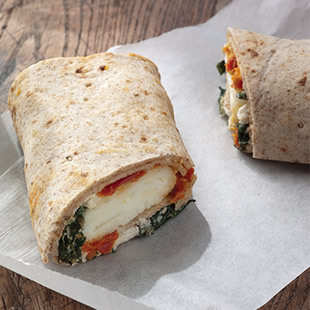 The Best: The Starbucks Spinach & Feta Breakfast Wrap has 290 calories, 3.5 grams of saturated fat, 6 grams of fiber, 19 grams of protein and 830 mg of sodium. It’s Starbucks’s lowest-calorie option, plus the 6 grams of fiber will help you feel full longer. If you want a more classic breakfast sandwich, try the Starbucks Turkey Bacon & White Cheddar Classic Breakfast Sandwich. It has 320 calories, 2 grams of saturated fat, 3 grams of fiber, 18 grams of protein and 700 mg of sodium. The Worst: The Starbucks Sausage & Cheddar Classic Breakfast Sandwich has 500 calories, 9 grams of saturated fat, less than a gram of fiber, 19 grams of protein and 920 mg of sodium. Choosing sausage over the turkey bacon in the healthier sandwich makes a big impact on calories and saturated fat. 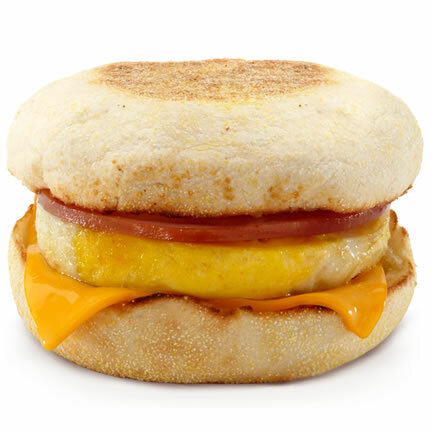 The Best: The McDonald’s Egg McMuffin® has 300 calories, 5 grams of saturated fat, 2 grams of fiber, 18 grams of protein and 820 mg sodium. This basic breakfast sandwich has fewer calories and less saturated fat than any of the McDonald’s options with sausage, bacon or served on biscuits or McGriddles®. The Worst: The McDonald’s Sausage, Egg & Cheese McGriddle® has 560 calories, 12 grams of saturated fat, 2 grams of fiber, 20 grams of protein and 1,360 mg of sodium. By choosing a breakfast sandwich that has sausage and is served on a pancake-type bun, called a McGriddle®, you add extra calories, saturated fat and sodium. 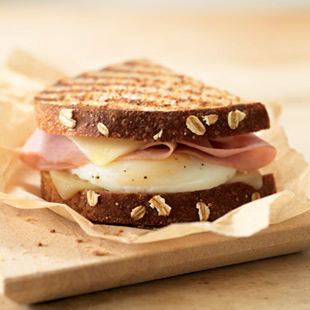 The Best: The Panera Bread Breakfast Power with Ham on Whole Grain has 340 calories, 7 grams of saturated fat, 4 grams of fiber, 23 grams of protein and 820 mg of sodium. If you want to cut some saturated fat and sodium, consider ordering it without cheese, which would slash the sat fat down to 2 grams and the sodium to 570 mg. The whole-grain bread adds extra fiber, which should help give this sandwich staying power. The Worst: The Panera Bread French Toast Bagel with Sausage, Egg & Cheese has 670 calories, 14 grams of saturated fat, 2 grams of fiber, 29 grams of protein and 1,280 mg of sodium. The combination of sausage and cheese really adds up in both saturated fat and sodium. Putting it on a bagel adds substantially to the calories and sodium (350 calories and 620 mg of sodium in the bagel alone). The Best: The Dunkin’ Donuts Egg & Cheese on English Muffin has 320 calories, 5 grams of saturated fat, 1 gram of fiber, 14 grams of protein and 820 mg of sodium. Dunkin’ Donuts also has “Egg White Wake-Up Wraps”—a lighter option, but with only 150 calories and 10-11 grams of protein in the veggie and turkey sausage ones, I’m skeptical that they’d tide you over until lunchtime. The Worst: The Dunkin’ Donuts Sausage, Egg & Cheese on Croissant has 710 calories, 20 grams of saturated fat, 0.5 gram of trans fat, 2 grams of fiber, 25 grams of protein and 1,370 mg of sodium. Not only is this high in calories, it packs a heart-unhealthy punch with the combination of saturated fat and trans fat. For a 2,000-calorie diet, the recommended cap on saturated fat is 16 grams per day. The 20 grams in this sandwich is equivalent to the sat fat of 2 1/2 tablespoons of butter. 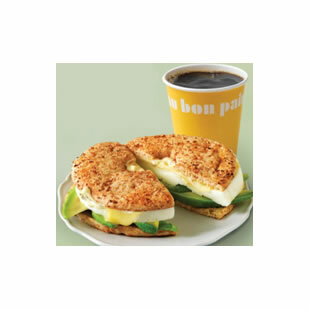 The Best: The Au Bon Pain Egg Whites and Cheddar Breakfast Sandwich has 250 calories, 6 grams of saturated fat, 6 grams of fiber, 20 grams of protein and 550 mg of sodium. This sandwich is low in calories with a whopping 6 grams of fiber, making it a good option. For just a few extra calories you can get this sandwich with avocado—then it clocks in at 310 calories, 6 grams of saturated fat, 9 grams of fiber, 20 grams of protein and 940 mg of sodium, giving you some extra fiber and healthy monounsaturated fat from the avocado. The Worst: The Au Bon Pain Sausage, Egg and Cheddar on Asiago Bagel has 810 calories, 20 grams of saturated fat, 2 grams of fiber, 41 grams of protein and 1,340 mg of sodium. This one tops the charts for calories and vies with the Dunkin’ Donuts Sausage, Egg & Cheese on Croissant for most saturated fat and sodium. Although everyone has different calorie needs, 810 calories is high for one meal for most people. To put those calories in perspective, for 810 calories you could have 2 slices of toast, 2 eggs, a pat of butter, a 16 oz. nonfat latte, a banana, an orange and 2 tablespoons of peanut butter. Or a Big Mac and small fries with 40 calories to spare. It’s possible to make a smart choice at any of these fast-food restaurants. For the healthiest choice (lowest in calories, sodium and saturated fat), skip the sausage, opt for a lighter bread choice (choose an English muffin, wrap or toast over a bagel, croissant, pancake or biscuit) to save calories—and get a whole-grain one, if you can, for added fiber. And, if you’re feeling really virtuous, skip the cheese. Plus, if you’re at a place where you can customize, ask them to add veggies! Broccoli, tomato and avocado are all great additions to breakfast sandwiches. Which Is a Healthier Breakfast: Pancakes or Eggs?